Last week’s Supreme Court ruling on “South Dakota v. Wayfair” upheld a 2016 South Dakota law that requires online merchants with more than $100,000 in annual sales to state residents or 200 transactions with state residents to collect sales tax. Our technology and legal teams are reviewing the ruling and planning for likely outcomes. We will stay ahead of this issue so you can focus on running your bike shop. 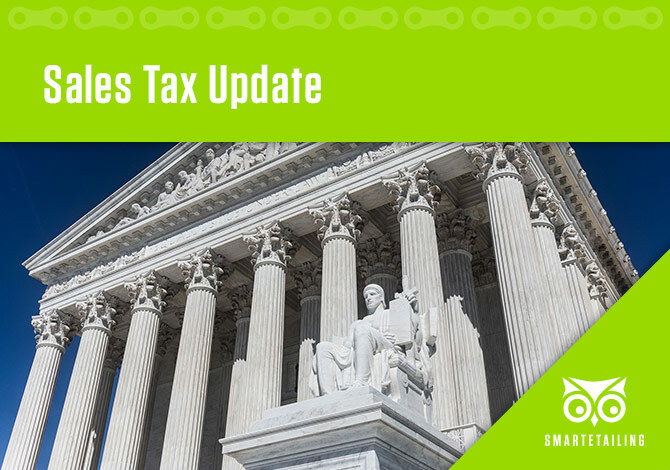 We want to reassure you that SmartEtailing currently has features to help bike shops who sell out of state collect sales tax at the state level. Our Support team can assist any client with these settings based on your preferences. The Supreme Court has overruled a 1992 decision that prevented states from requiring businesses to collect sales taxes if they didn't have a physical presence in the state. South Dakota wanted out-of-state retailers to begin collecting the tax and sued several of them: Overstock.com, Newegg, and home goods company Wayfair. “States will now likely revisit their laws and try to model new bills after South Dakota’s so they can begin collecting sales tax on online purchases,” Joseph Bishop-Henchman of the Tax Foundation wrote in an analysis of the ruling. Especially for local bike shops looking to increase online sales to your local market, this ruling is good news. Your business will become more price competitive, and your modest out of state sales volume likely won’t require you to remit payments to additional states. On the flip side, this could add some costs for bike shops who sell across the country at a high volume and haven’t yet engaged their tax attorneys for this purpose. The process of figuring out how to remit sales tax in states where you’re not located can be complicated. Those opposed to reversing the decision argued that starting to charge sales taxes on a state level would open a can of worms, as local taxes could get extremely complicated. In its challenge, Wayfair said having businesses navigate each state’s laws would be a herculean task, referring to the small, independent businesses that don’t have the manpower to start deciphering tedious tax codes. But based on the likely scope of new legislative standards, small online sellers won’t have to bear the same burden as large sellers. And software automations exist for managing sales tax across multiple states. SmartEtailing has a system in place for collecting the appropriate state taxes from your online shoppers, so our clients have the appropriate tools to comply with changes. Depending on how eventual regulations develop, and how each bike shop chooses to configure their website based on the advice of a tax professional, SmartEtailing will be prepared to assist with compliant online tax collection. You don’t need to drop everything and update your website settings this minute. But you should work with our Support team to confirm your sales tax settings, especially as more specifics emerge and you have a chance to consult a tax professional. Consumers like the convenience of shopping online. Now that they have to pay a little more for this convenience, their preferences are unlikely to change. Last year according to Bloomberg, 49 percent of retail sales growth came from online shopping. The ruling will not make a difference for shoppers who use certain popular sites. USA Today points out that most of the top 20 ecommerce sellers already collect sales taxes in most states because they have warehouses or local showrooms there or because state laws can successfully reach them. It is generally accepted that bargain hunters will continue to seek options for avoiding tax on online purchases, but the majority of consumers will simply take this change in stride. While many small business owners are anxious about this change because of the unknowns, most consumers view this as a positive change that supports local small businesses. Is your SmartEtailing website ready? SmartEtailing does currently have features to collect sales tax at the state level. Our Support team is happy to confirm your settings and walk you through any updates. Our platform allows you to configure the individual state sales tax rates that shoppers pay on your website. Additionally, you have the ability to configure your website to ship to your local state only. The most conservative option is to restrict online selling for in-store pickup only. You have several choices. In preparation for this decision, we also have new features in development that offer additional tax solutions. We have been monitoring this case closely and had a plan in place for this possible ruling. We are not able to give specific tax advice to retailers but we are able to help clients configure the SmartEtailing platform to meet their preferences as advised by a tax professional.